In John’s newest power-packed presentation he reveals the critical steps that must be planned-out and executed in order for any organization to create and sustain a renewed, winning culture that engages, inspires and unleashes talent in support of driving breakthrough results. Culture is the foundation from which successful organizations are built—however, most struggle to create an environment in which employees can be fulfilled, effective in their work, and feel “unleashed”. What exactly is it that makes some organizations achieve and sustain breakthrough success, while others struggle with cultural transformation…whether it involves crafting a new compelling vision and culture or merging cultures? 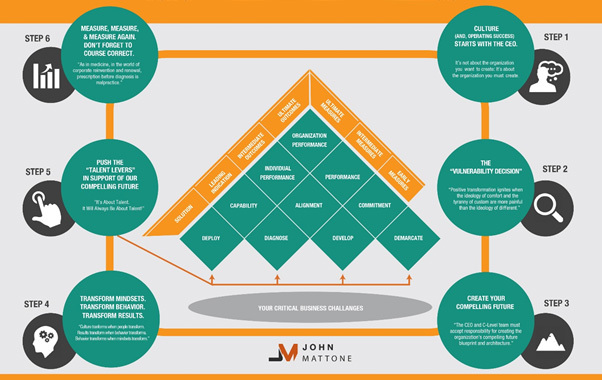 Based on years of research and advising Fortune 1000 CEO’s and senior leadership teams, John Mattone argues that the highest performing organizations both embrace and execute 6 critical steps to achieving positive transformation, but transforming culture always begins with a CEO who is both willing and able to “think big” and be bold while maintaining a heavy dose of “humility”. In this dynamic presentation, John Mattone details the essence of what is meant by the “vulnerability decision” as well as the other critical steps that must be executed in order for your organization to effectively accelerate its’ own reinvention.